Please note: Drop shadows for illustration only. This digital product has been saved as individual png. files at 300 dpi. Bundle up and save with the complete 'Find Peace' collection. Part of the March 2017 BYOC at The Lilypad, this pack combines the "Find Peace" elements, 'extras' and papers along with an alphabet and numeral set PLUS the template set. A pack of two co-ordinating templates. These templates are provided in both psd and TIFF formats. (Also provided as separate png elements AND .page templates for those whose scrapping programs require them - I recommend you don't download these options unless you need it). "Spring is the first kiss of Summer." 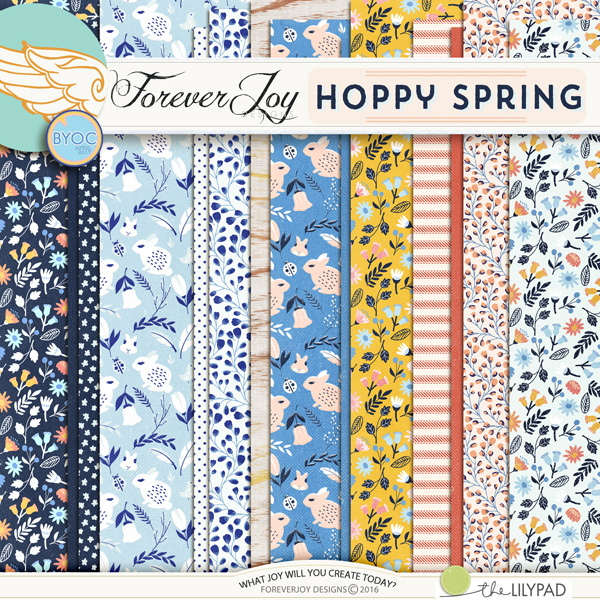 This collection includes 12 patterned papers, 3 bonus solids, and a collection of pretties including a knit banner, a berry branch a little bird, 2 bunnies, a ties layered bow, 2 brads, 2 butterflies, 2 buttons, a picket fence, a sweet dandelion, a doily, 5 flairs, 5 flowers, a bit of lace, 2 ribbons, a flowerpot, a leaf, a journal tab colored 3 ways, 3 strips of washi tape and 11 pieces of Word Art. *not all items are shown in preview. This item coordinates perfectly with the other APRIL 2017 BYOC products! Drop shadows for illustration only. This digital kit has been saved as .png files at 300 dpi. Not all items shown. Personal Use Only please. This collection of pretties includes a knit banner, a berry branch a little bird, 2 bunnies, a ties layered bow, 2 brads, 2 butterflies, 2 buttons, a picket fence, a sweet dandelion, a doily, 5 flairs, 5 flowers, a bit of lace, 2 ribbons, a flowerpot, a leaf, a journal tab colored 3 ways, 3 strips of washi tape and 11 pieces of Word Art. *not all items are shown in preview. This item coordinates perfectly with the other APRIL 2017 BYOC products! Drop shadows for illustration only. This digital kit has been saved as .png files at 300 dpi. Not all items shown. Personal Use Only please. "and suddenly, you were my everything." Over 60 detailed pretties including enameled baby and little critter pins, a sweet banner of onsies, a branch of baby breath, 2 differnt baby block styled word art, a little felt teddy bear, 5 brads, 5 flowers, two gem buttons, 2 frames, a litle heart, a fern branch and a berry branch, tiny diaper pins colored 3 ways, a measuring tape, 2 strips of ribbon and two tiny bows, a rubber duck, a doily, a wood clothes pin, a vintage flash card, 3 spool toppers, 2 cork spots, toy baby rings and 13 pieces of word art. *not all items are shown in preview. This item coordinates perfectly with the other MARCH 2017 BYOC products! Drop shadows for illustration only. This digital kit has been saved as .png files at 300 dpi. Not all items shown. Personal Use Only please. "and suddenly you were my everything." This portion of the collection includes 18 patterned papers (and 5 bonus solids!) Love the papers? Check out the page kit where you can get find them bundled with the coordinating pretties! This item coordinates perfectly with the other March 2017 BYOC products! Drop shadows for illustration only. This digital kit has been saved as .jpg files at 300 dpi. Not all items shown. Personal Use Only please. March BYOC 2017 Machine Stitching - 80 pieces! This pack of machine stitched shapes are perfect to accent your March BYOC or any project! Shapes include stars, circles and straight lines with different style stitching for you to build your own page borders, card borders or cut up to apply to papers, elements and word art! 80 pieces included (10 stitched elements in 8 colors each). A pack of 15 vintage images and 7 washi tapes in 2 versions, that coordinate with the March 2017 BYOC, to embellish for your pages! A pack of 15 metal bits , that coordinate with the March 2017 BYOC, to embellish for your pages!